9 years after launch, many people have now heard of Bitcoin, the first, the most developed and most widely used decentralised cryptocurrency. But did you know that there are currently over 1400 other cryptocurrencies? That number will likely continue to rise in the future, as anyone can now easily create their own currency. You just have to copy the open source Bitcoin code. You could even change a few parameters, such as the total supply, the encryption, or the mechanism to agree on the real version of this new blockchain. In the past, creating a currency was a privilege for kings, rulers and governments. The invention of Bitcoin now enables anyone to create their own currency (I’ll get to whether that makes sense in a moment), like the Internet enabled anyone to do many things that were previously only possible for a privileged few. You can disagree with that if you want and refuse to ever have anything to do with any cryptocurrency or token, but doing so means ignoring evolution and the benefits that programmable money can bring to society. Change is hard to accept, but give it a chance and don’t dismiss it straight away. Millions before you have been highly skeptical. Others are quite the opposite, they’re trying to catch them all, far eclipsing the craziness around Pokemon Go last year. With the crypto-mania in full force, I often get questions about all kinds of cryptocurrencies. Many people feel like they missed the boat with Bitcoin and think that somehow, many of the lower priced cryptocurrencies will follow in its footsteps or become even better. Each time I answer these questions, I “give a man a fish, and feed him for a day”. There are some projects that genuinely want to change the world, but there are also many scams in the cryptocurrency space. It’s a universal rule: Where there is money, there are people who try to take advantage of you. On the websites of these projects, you will find bold claims, names with impressive-sounding credentials and whitepapers to convince you why the world needs this. Read some convincing comments on Social Media about ‘the next big thing’. Look at the price on Coinmarketcap. Visit the website and scroll through it. Tell people close to them to also buy in. Bonus: change Social Media profiles to crypto investor. I want to help you dig deeper, because investing in something you barely understand is a recipe for disaster. To evaluate a project well, I usually try to (theoretically) destroy it in every way I can think of and see what remains after I’m done. If that is anything with potential, then it has my attention. So let’s do that through 5 questions. You can click them open to read a more elaborate explanation. 1. What problem is it trying to solve and is this a big enough problem for enough people? Read the first part of this great post by Paul Graham on why it is so important to work on a real problem. The example of a social media network for pets completely nails it. Many people can imagine a world in which people would theoretically want to use a cryptocurrency or token for something. However, when asked if they would do so on a daily basis themselves, or if they know someone who would, the answer is often ‘no’. There are a bunch of cryptocurrencies/tokens that are used for one specific function, such as transferring ownership of one specific thing. To use them for that function, you first need to exchange a government currency for it. That is a bad user experience, so you better have a good reason to make that exchange. Decentralisation naturally comes with a worse user experience, while people generally expect something to be way better than the status quo before making the switch. It seems like too few people are asking themselves: Would I want to own, manage and secure dozens of currencies or tokens to get by in my every day life? The answer is probably no, so this is an adoption challenge. Any cryptocurrency or token that exists for a single function (e.g. paying your dentist, storing a digital fingerprint of your diploma) has a massive adoption hurdle and likely isn’t really solving a problem, but creating one. For this reason, there are people working on ways to transfer and use the same cryptocurrency across different chains. This concept is known as a sidechain, where most activity does not affect the main blockchain. If sidechains become the de-facto solution, it is likely one cryptocurrency will dominate the rest and many of the existing ones will become fully obsolete. Group number 2 consists of the platforms that are decentralising for the sake of it. Just because we can decentralise something, that doesn’t mean people want it to be or that it’s truly solving a problem for enough people. Decentralised storage is great in theory for example, sounds cool, but it is generally only worth the price for people that run into issues with the policies of large cloud companies. These companies tend to have impressive uptimes and price wars, so as it turns out, currently only a small group of people are interested in decentralised storage. Another example is the decentralisation of Airbnb, which I’ve written another article about. Group number 3 consists of platforms which claim to be the Bitcoin 2.0, with far better scalability. – Have they actually ran into any scaling problems to be able to make these claims? – Are their claims based on results in optimal environments? – What trade-offs are they making to achieve better scalability? The answers will usually question whether it is truly better in the long term. In group number 3 you’ll also find platforms which claim to have better smart contracts than anything that exists today. Smart contracts are programs on a blockchain that execute once certain conditions have been met. To date, the most used smart contracts are multi-signature transactions. These transactions require approval from multiple devices or people before they can be sent. Other than that, there has been heavy experimentation, but little success in practice. Writing secure smart contracts is still very hard and once they are out there, they can do a lot of damage if poorly written. Instead of chasing a promise of a better technical implementation than what exists, it is important to consider whether the ‘first’ implementation was the problem for adoption, or if people simply aren’t interested in using this kind of solution (yet) because it hasn’t matured. It’s also important to remember that any project which invents something amazing will get their work copied by dozens of other projects. Such is the nature of open source. So for a new project to overtake existing ones, it will need a much larger network effect, not necessarily better technology. The claims of having better technology are usually marketing ploys to try to achieve that network effect. The network effect is where many of the Blockchain > Bitcoin people are missing the point. A blockchain is a piece of technology which can be copied an infinite amount of times, just like a bunch of developers can recreate the way Facebook looks. What you can’t copy is the network effect. All the people that are already using it today who won’t just walk right over to something else because you claim to have better technology. The network effect is what makes these networks so powerful and valuable, a blockchain is just one piece of the puzzle which enables that, but not the sole solution by itself. So to come back to my point at the start of the post: just because there are over 1400 cryptocurrencies, that doesn’t mean most of them are relevant to more than a handful of people. This is a large group that has no intention to build anything better. They are riding the blockchain and cryptocurrency buzz and hope to make as much money as possible through marketing tactics. I’ll help you spot and avoid them through the next 4 questions below. B. Those who think they are doing the right thing but haven’t thought it through. This is a smaller group. It mostly consists of people with theoretical ideas to use a blockchain or cryptocurrency for X. They know there are hard problems that need to be solved to make it work, but they often assume that with enough funding, they can hire brilliant minds to solve these problems for them. Worst case scenario they walk away with a big chunk of profit, best case scenario it actually works, they help a lot of people and they become billionaires. It’s just business to them and they have little empathy for Rose or Johnny who invested some of their savings and lost it. C. Those who want to create something of value but mostly want to earn a lot themselves. You will find some surprising names in this group if you haven’t looked into them yet. An easy way to spot these projects is by looking at whether their cryptocurrency/token supply is (heavily) premined. This means that a part of the supply is already in the hands of the creators before launching to the public. More about this later. Many projects fall into this group because there are few truly altruistic people in the world. That is no criticism, being rewarded for your work is absolutely fair, but in many cases the reward people feel like they are entitled to raises some eyebrows. Investors seems to be growing more fond of tying rewards to reaching specific development milestones, which seems like a much fairer way of going about it. D. Those who try to create something of value and don’t expect anything in return, knowing it will reward them in many ways in the long term. These projects are by far the rarest. If you’re a developer willing to sacrifice your time to try to change the world, much of the community will revere you. Of course there can be something in it for these people too. If they were an early adopter that didn’t have to sell their holdings to pay for their living, they are rewarded in the long term if the cryptocurrency or token is truly useful, gets adopted and increases in value. If they can’t sustain a living, we’ve seen examples of the community or companies coming together to fund their work, because it is so important. 3. How much development activity is there? To check the development activity of a project, you first need to find the source code. You don’t need to be a developer and know how to code to be able to find this information. Just Google for “*Project Name* Source Code”. You will usually end up on Github, a popular platform to collaborate on software projects. The creators don’t want to reveal their code. If you still want to invest in either case, you must have a serious risk appetite. If we assume you can find the source code and developers, you likely don’t understand it in-depth, but you can look at how much and what kind of work the developers are doing to get a good indication of how seriously they are taking this project. Are they creating new things or just copying the work of others? This may be hard to find out for a non-technical person, so you will likely need to do some more googling. There was a lot of contention around the “SegWit2X” fork for Bitcoin last year for example. In this event, a handful of companies tried to force changes in the rules of the Bitcoin network, against the wish of the majority of the users. The underlying reason was to overtake the reference software from the open development group that currently maintains it. If you compared the amount of noise that SegWit2x supporters made to the activity in the code repository however, you could see what was really going on: Next to no activity and almost zero testing, which ultimately lead to a catastrophic standstill of the network for the nodes that were running the software. So while most people like to focus on the market cap of a cryptocurrency or token, development activity is a very valuable metric that tells you a lot about the future of the project. 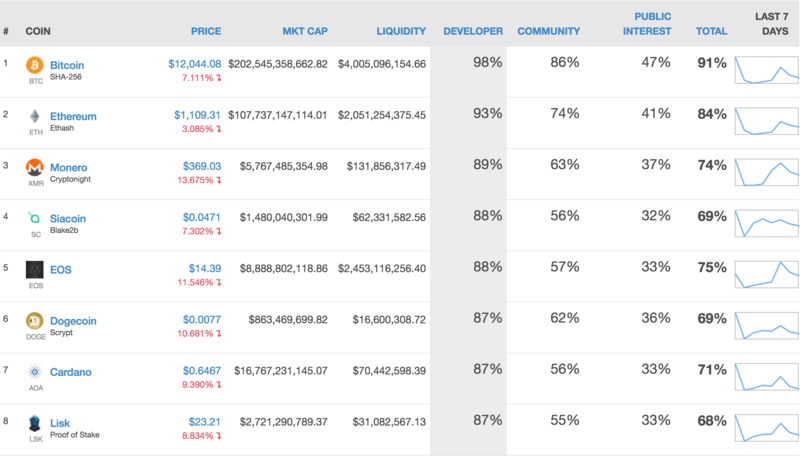 Coingecko even has a separate column for it, which paints a very different picture. 4. Is the supply premined? Cryptocurrencies need some kind of distribution mechanism to get it into the hands of the people. There are various ways to do this. Most cryptocurrencies distribute the currency through a process called mining, because it is the best working mechanism we have found today to secure an open global decentralised network. To mine a cryptocurrency, anyone can run software on a computer to create and add blocks of transactions to its blockchain. The mining software fills up a block template with transactions and then tries to be the first to solve a cryptographic puzzle. Once the puzzle is solved, the software will prove to the rest of the network that its solution is correct and the block of transactions valid. Solving the puzzle takes a lot of energy, as heavy competition leads to the algorithm making the puzzles harder to solve. This energy consumption is also known as “Proof-of-Work”. To convince the rest of the network that your block is correct, your software effectively proves to them that you have put in the work, which cannot be falsified. So next time someone tells you Bitcoin isn’t backed by anything, it is effectively backed by energy, and in the case of clean energy, we have solar-powered money! If the miner’s work is correct, the rest of the network will accept their block, add it to their copy of the blockchain and the creator will be rewarded with new cryptocurrency in that network. Mining is probably not economically feasible for you unless you’re very knowledgeable about it and have access to very cheap electricity, so don’t fall for any mining scams promising grand returns. The system effectively enforces and rewards good behaviour. When you spend energy to create a false block, it will be rejected by the network and you will lose a lot of money. This is the beauty of Bitcoin, it is the engine that has helped it to grow to a network worth hundreds of billions. Bitcoin steers human nature to do what it does best, which is protecting and pursuing our own interests. When Bitcoin launched, many people laughed it away for the first few years and few took interest, so in order to keep it going, the unknown inventor named Satoshi Nakamoto mined an estimated 6% of the existing bitcoin supply over the course of more than a year, to keep the Bitcoin blockchain going. Almost none of these coins were ever moved though and Satoshi disappeared from the project in 2010 to let it be truly decentralised. Most other cryptocurrency projects have also mined a large part of their supply, but they did it before releasing their projects to the public, known as premining. Some of the people behind these projects hold just a few percent, others go up all the way to 95% of the supply. Ripple Labs holds 63% of all the Ripples for example, a public fact that surprisingly few investors are aware of. Most of the premined projects provide a reason why they do this (to ensure a stable market, to fund development for many years…) but it is important to ask yourself if a project truly needs hundreds of millions or even billions for that, with generally small development teams. 5. What are others saying about it? You likely found out about the cryptocurrency or token because someone was promoting it. In most cases this is to try to get you to buy into it, to benefit the person promoting it. The first easy thing you can do in that case is to look at previous things this person has posted. If they’re constantly promoting one cryptocurrency or token after another, chances are they are just trying to pump up the price to make a profit and don’t care about whether the project itself will become something useful. It is hard to give an objective and thorough explanation about any cryptocurrency or token. The truth is that without people inflating their image, many of them would only be worth a fraction of what they are worth today. People are not always trying to deceive you, sometimes they are poorly informed or so excited about a project that they oversell what it is or will be capable of. Most of the cryptocurrencies and tokens have a value that is based on what it may become one day, not what value it already provides today. There is nothing wrong with this in particular, it is just important to keep in mind and decide for yourself whether you are interested in current value and/or potential future value. Instead of only listening to people who are promoting a project, you should search for people debunking it. Listen to both sides of the story to dig deeper. If you can’t find anything, chances are the project isn’t mature enough to get much peer review yet. It takes a lot of unrewarding effort to debunk some of the claims that are being made and doing so will get you a lot of backlash from people who are trying to profit off deception. While this isn’t an exhaustive list, these 5 questions should get you far in evaluating any cryptocurrency or token. If there are any questions you think I should add, let me know! If you have a friend that keeps telling you to buy a certain coin or token, send them this post! If there is enough interest, I can write follow up posts of applying these questions to some of the top 10 cryptocurrencies.